Section III82. Despite systematic consultation with Member States, the Monitoring Team has been unable to establish that ISIL ever generated significant funds from human slavery or sexual violence, although it was certainly massively engaged in such crimes on a basis internal to the so-called “caliphate”. 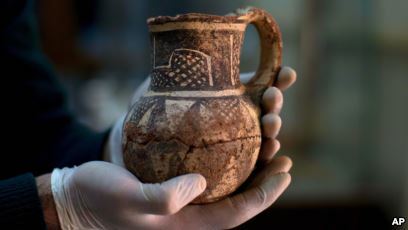 Member States also broadly share the analysis that ISIL did not systematically or fully exploit the funding potential of looting and trading in antiquities and cultural goods. Nevertheless, it will not be possible to draw firm conclusions on this until more is known about what was taken, and until enhanced detection and enforcement efforts have yielded more information. While the 25-page report goes on in Section B. Resolution 2347 (2017) on Cultural Heritage to mention the strategic and exemplary training conducted by the World Customs Organization, who have launched a training handbook on the prevention of illicit trafficking of cultural heritage, it omits other UN trainings facilitated by UNESCO such as the Countering Antiquities Trafficking in the Mashreq: A Training Program for Specialists Working to Deter Cultural Property Theft and the Illicit Trafficking of Antiquities program. This 5-day training, animated by experts from UNESCO, UNIDROIT, INTERPOL, ICOM, UNODC and four trainers from ARCA (Association for Research into Crimes against Art), was structured around four modules, each designed to address issues of common concern in affected source and transit countries. The topics addressed included: Museum and Site Risk Management and Hazard Mitigation; Art Crime Policing and Law; The Conflict Antiquities Trade - Characterizing and Anticipating Trafficking of Cultural Heritage and Cultural Property Crimes in the Context of Contemporary Armed Conflicts; The International Art Market and The Trade in Unprovenanced Antiquities - The Interface Between Legal and Illegal Actors in Source and Market Countries. Sessions for Countering Antiquities Trafficking in the Mashreq consisted of a mixture of lecture presentations involving art security awareness briefings, comprehensive discussions and practical demonstrations that all have the same primary objective – to pass on specialist knowledge while allowing a limited amount of time for practical, first-hand discourse drawing on the participants own experiences thereby allowing for contemplation and further debate. ARCA's collaboration on this in-country UNESCO training for representatives from Iraq, Jordan, Lebanon, Syria, and Turkey is not the only UN facilitated training omitted from this report, nor is it the only non UN training program which has been developed to assist in the battle against plunder in conflict. ARCA also provides intensive Minerva Scholarship training for eleven weeks in Italy for Levant heritage professionals, established in response to scholarly concerns of heritage destruction and looting throughout Iraq, Libya, Syria, and Yemen. Other NGO's, likewise have also supported and/or conducted training to assist in this critical area of concern. "it will not be possible to draw firm conclusions on this until more is known about what was taken, and until enhanced detection and enforcement efforts have yielded more information." Most endeavours to establish such information have, are, and will continue to be seriously hampered by chronic underfunding. This makes it difficult, if not impossible, for member states or UN agencies and their NGO partners and affiliate supporting organisations to respond effectively to the scale and scope of the problem. Stealing from the past is destroying the future. Yury Fedotov, Executive Director of the United Nations Office on Drugs and Crime (UNODC) & Director-General of the UN Office in Vienna (UNOV) reminds collectors during the UN General Assembly - to look more closely at their antiquities purchases to ensure they are not contributing to the destruction of world heritage sites or funding organized crime.